One of the reasons I love living in Seattle so much is the temperate climate of the Pacific Northwest. After growing up in Alaska, I have lived with enough snow to last a lifetime. When I want snow, I go to the mountains. Despite the fact that this is definitely not an outdoorsy blog, I have been known to go outdoors from time to time. Especially when there’s a beautiful photo opportunity. One such opportunity came last March when I was invited on a winter hike in Mount Rainier National Park. An unexpected snowfall made for an even more beautiful experience, even though it obscured our views of Mount Rainier herself. Now that snow is starting to fall on the Cascade mountains again, I want to make sure fellow not-so-outdoorsy types know how to safely enjoy a hike like I did. There’s nothing quite like setting the first steps in freshly fallen snow. Get out there for at least one hike this winter! 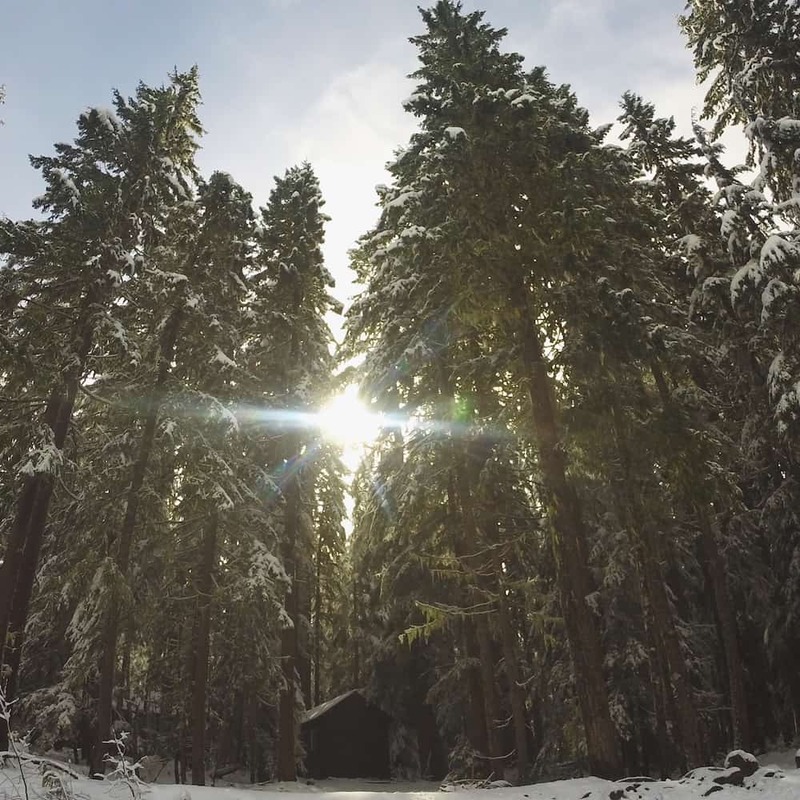 A perfect winter escape to Mount Rainier National Park. Mount Rainier National Park is a 956.6 square kilometer national park established in 1899 to protect Mount Rainier and the surrounding region. A long-dormant volcano, Mount Rainier looms over the Seattle skyline from certain angles – much like Mount Fiji in Japan. Depending on conditions, you may not be able to reach Sunrise or Paradise in the winter. In my case I went hiking in Longmire. In Longmire, you can access the Wonderland Trail (a 93-mile circuit around Mount Rainier), stay in the National Park Inn, and explore the Mount Rainier National Park Longmire Museum. Bridge over the Nisqually River. On clear days, there are also spectacular views of Mount Rainier from the bridge over the Nisqually River, a short walk from the parking lot. The drive to Longmire is pretty good in winter, and the lots are well maintained. It never hurts to have a car with four-wheel drive when you’re heading into the mountains though! It takes about two hours to get from Seattle to Longmire. My trusty bag, and bright orange snowshoes! 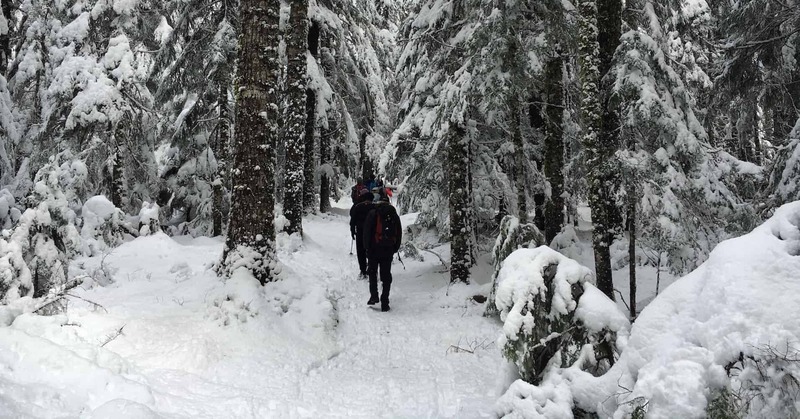 Winter hiking requires advance planning that you may not do for a hike in summer. You will need different clothing, additional layers, and a few extra pairs of socks in case your feet get wet. Yes, I look like a goober. I am also warm, and wearing snowshoes for the first time. 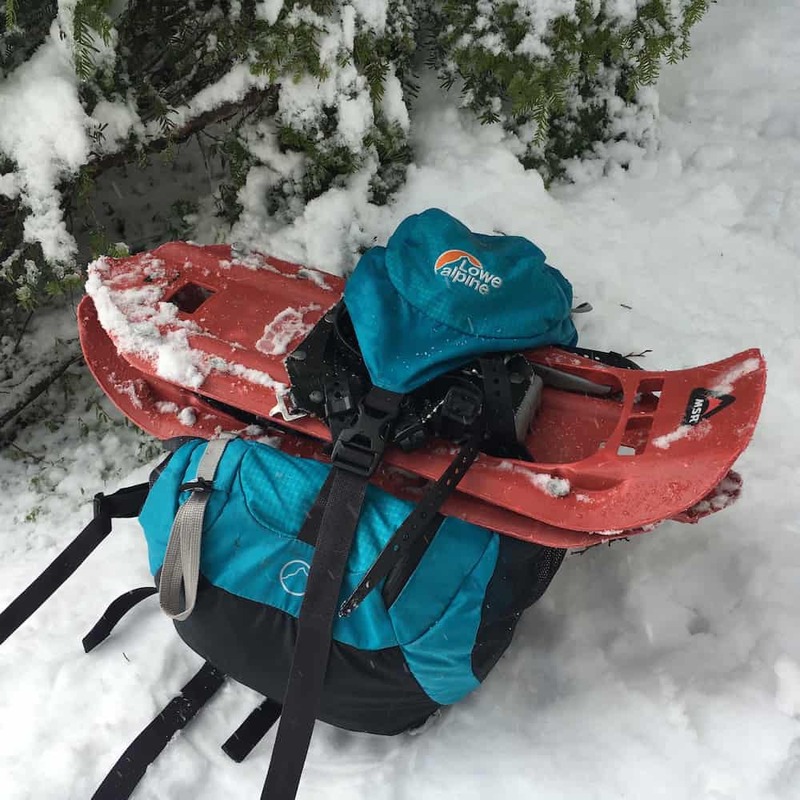 Evergreen Escapes provided us with snowshoes for our winter hike in Mount Rainier National Park. You may also need snowshoes or different hiking shoes that you normally use for summer hikes. Be sure to consult weather forecasts and reports for accurate information. The Mount Rainier NPS Twitter account (@MouintRainierNPS) is updated regularly with trail conditions and road closures. Lastly, you may think that winter hiking doesn’t require the same practical needs like food and water. Winter hiking is actually harder due to the conditions, and you should be sure to pack snacks to keep yourself energized. Despite the frozen water all around you, having enough water for your hike is also important – you’ll get tired and dehydrated faster when hiking in snow! When arriving in the park, you’ll need to pay the standard fee for access. The cost to access Mount Rainier National Park is $25 per vehicle. While paying, you can also ask the park ranger about trail conditions and options. Signs mark trails throughout Mount Rainier National Park. 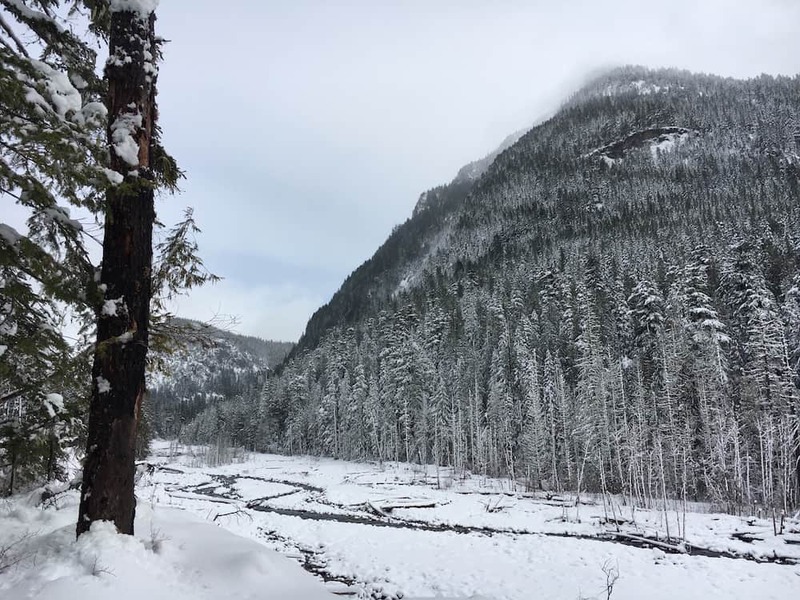 From Longmire, we spent time hiking along the Wonderland trail – we went out and back along one stretch of the trail instead of attempting any loops. 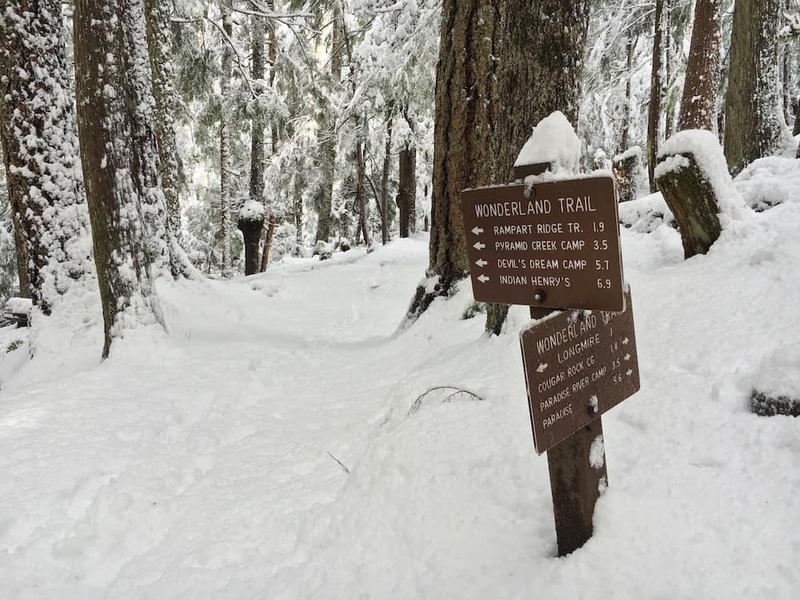 From other parts of the park, you’ll need to make sure you understand the rules for hiking (especially in winter conditions) and which trails are open. It should go without saying: obey the posted signs and verbal directions from park rangers, and don’t hike on closed trails. A view across the Nisqually River. If you have a GPS, it could be good to pack with your other gear. In fresh-fallen snow, it can be hard to discern the trail if you aren’t familiar with the area. Given that I had zero cell service during the whole hike, GPS could help you should the signs or trail not be clear enough to follow. As I’ve said, I’m not the most outdoorsy gal. 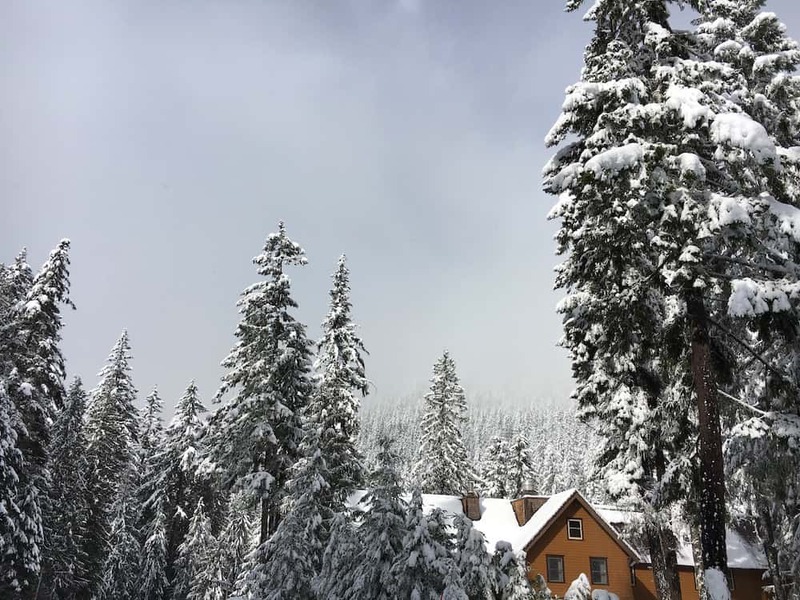 Instead of attempting to plan, coordinate, and successfully do a winter hike on my own, I went on a guided hike hosted by Evergreen Escapes. 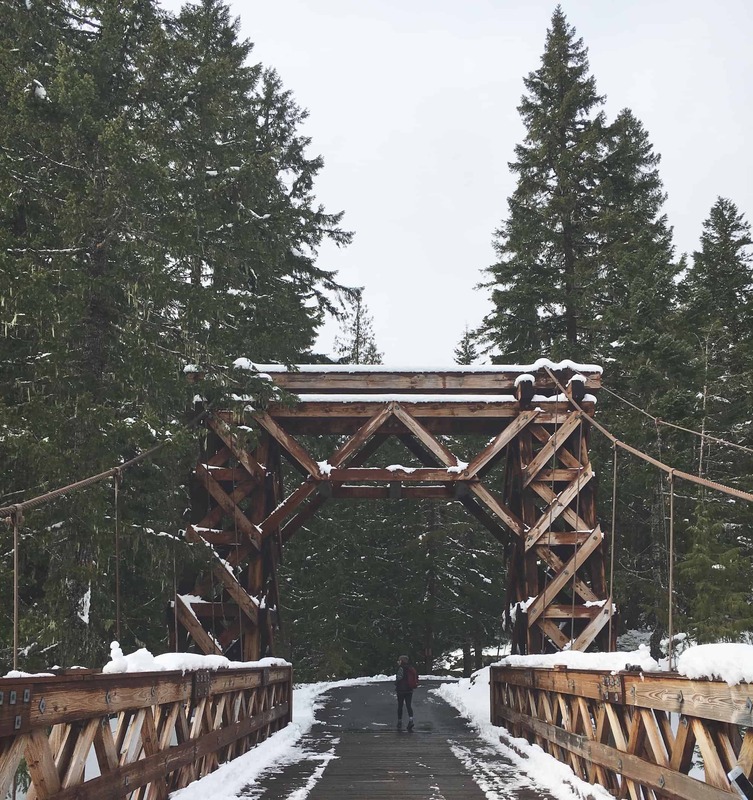 Even in winter, Evergreen Escapes offers day trips from Seattle to hike in Mount Rainier National Park. 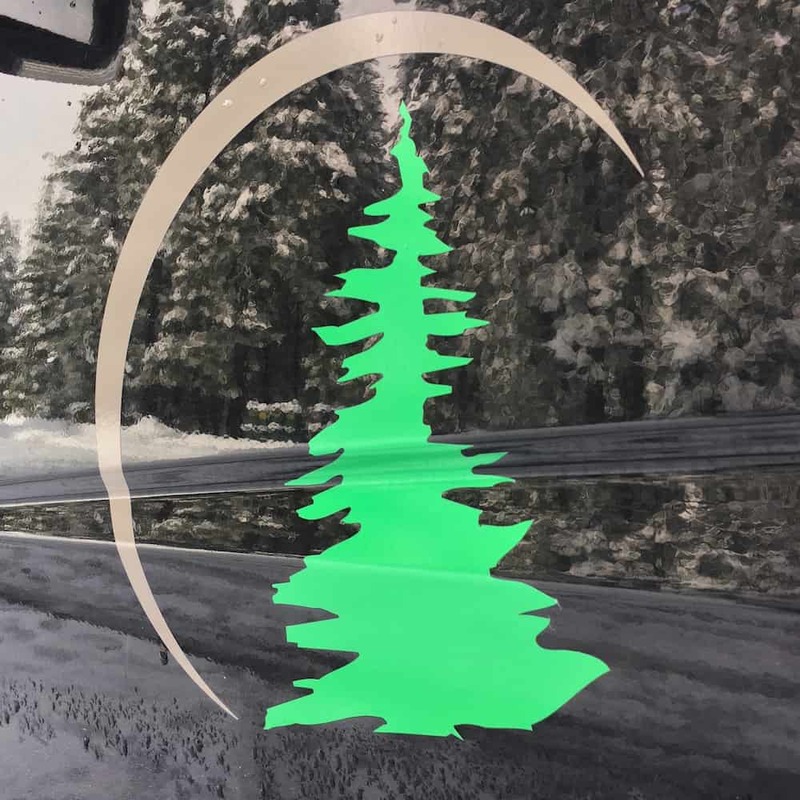 The Evergreen Escapes logo – on a snowy day! There are other providers, but I would highly recommend Evergreen Escapes for several reasons. First, they have a great reputation for providing high quality tours in the Pacific Northwest (and farther abroad). Second, from what I saw on our tour, the guides are competent outdoors-folk, and took care to make sure each of us hiking had a safe and enjoyable trip – even those of us who weren’t proficient with snowshoes or snow hiking. Evergreen Escapes Nature Walk in Mount Rainier National Park is $225 per person. This includes all gear, transportation, and lunch after the hike. Learn more on their website. Pack enough water and food, plus extra layers. Make sure you know the trail or have GPS to help navigate. Don’t hike alone unless you’re extremely competent at winter hiking in the region. If that last point is the case, you probably didn’t make it this far in the article, which is aimed at more beginner and intermediate hikers. Picture this during your hike – it will keep you motivated! Before you hit the trail, one last piece of advice: plan your warm up activities in advance. It can be anything from a steaming bowl of soup or cup of hot cocoa waiting for you at the end of the trail. If you have something to look forward to, you won’t mind so much if your feet get cold or you get snow down your back. The National Park Inn in Longmire, a welcome site after our day of hiking. 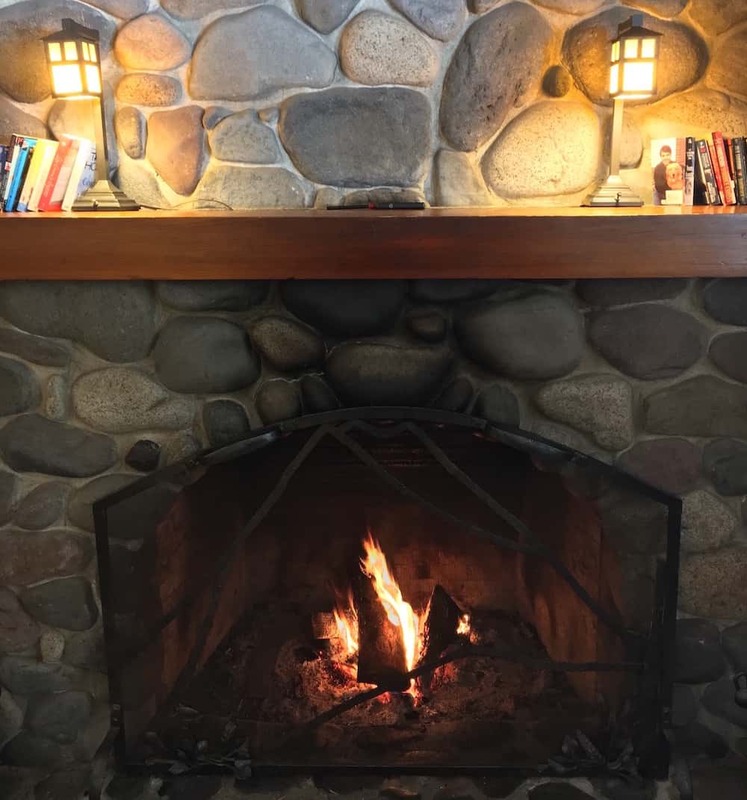 Warm up by the fire after your hike… your toes will need it! Have you ever gone hiking in the winter or snow? Where is your favorite trail? This is awesome! I have wanted to start hiking more next spring, but this looks like a beautiful winter hike! I live in Canada and it will soon be a winter wonderland here. 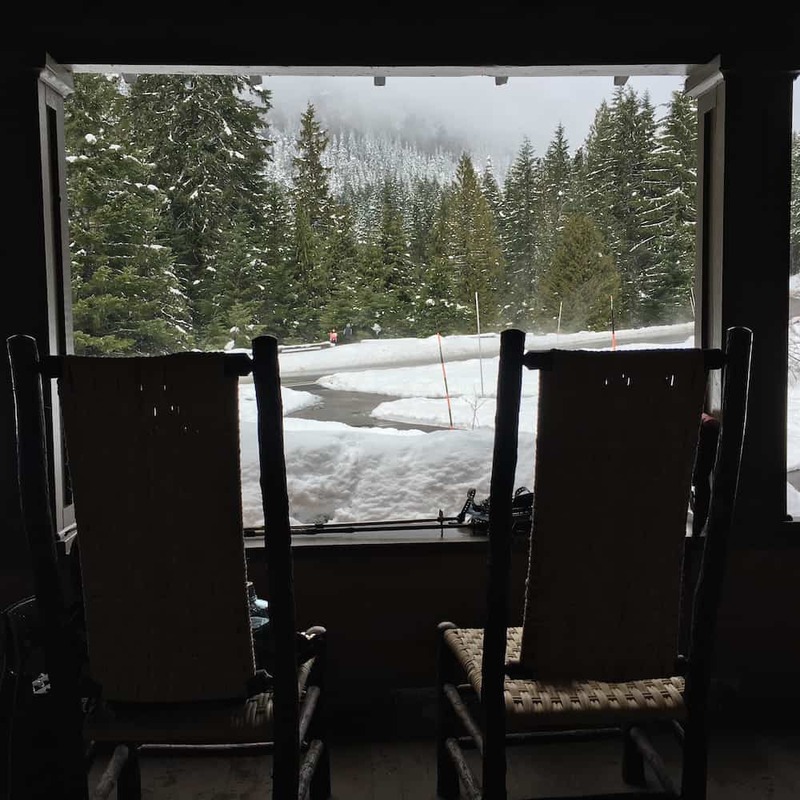 I do winter themed team building retreats for companies and Mount Rainier National Park looks like it would be a great location for the activity portions of our simulations. Thank you for bring it to our attention. What resorts are nearby and what is the closest airport? I have always wanted to go snowshoeing! This looks like such a beautiful place to go hiking. I’ll have to add it to my list of hiking destinations! I hope you can make it someday! We used new modern snowshoes, and they were really weird and kinda hard to use! Ooh, that cottage looks so cozy and I love the bonfire. I’m not an adventure-person myself, but this seems like a perfect place for someone who is. You took some gorgeous pictures! I’ve never done any serious winter hiking. I went hiking this weekend, but it was more of the hot, steamy, muddy, tropical rainforest kind of hiking. haha! This looks like a really cool experience! Wow! This is awesome! I have wanted to start hiking but we cant do it here in Africa but this really looks like a beautiful winter hike, so glad you had fun. My first hike in Mount Rainier Park was life changing…it was so beautiful. There were little chipmunks everywhere that you could hand feed and the scenery was sooo beautiful…I admit, I cried, I was so overwhelmed. Cannot wait to get back! That first photo is jaw-droppingly gorgeous!! I’m in awe. I would so love to go and do a hike like this! I love winter weather and snowy scenes like the ones you posted just seem magical to me. (Can you tell I live in TX and rarely see snow? lol) Great tips and a great post! Beautiful! Love your photos. 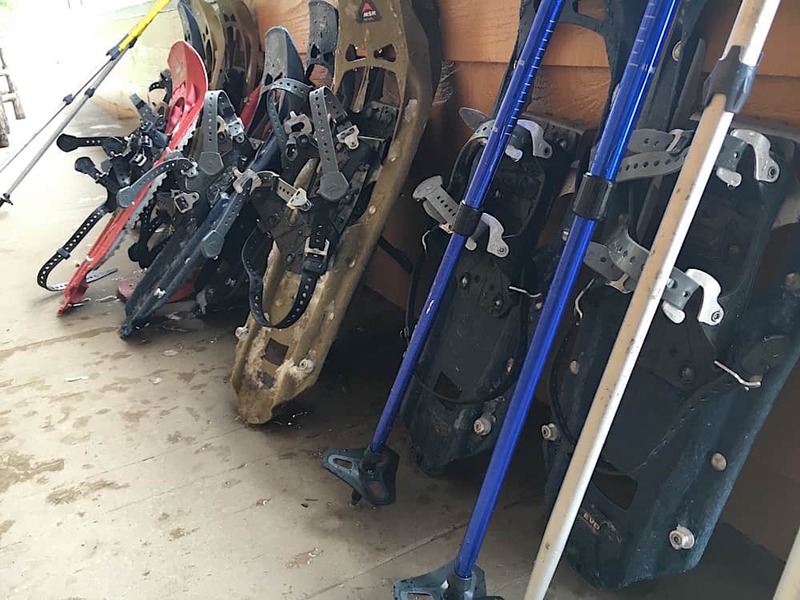 Recently just went snowshoeing there and I absolutely loved it. I say I’ve been to Rainier more times than most locals hahaha I spend way too much time there. Let’s go if you’re ever back here! My girlfriend actually loves very close by to Rainier in a little town called Bremerton and while we have tackled the hike in the summer time, I am yet to experience Washington in the winter. Nevertheless, some of these views look absolutely spectacular and as a non-native, your staying safe tips are vital. Might be able to impress the future in-laws with some local knowledge next time I visit! I love winter, so reading this post made me smile. 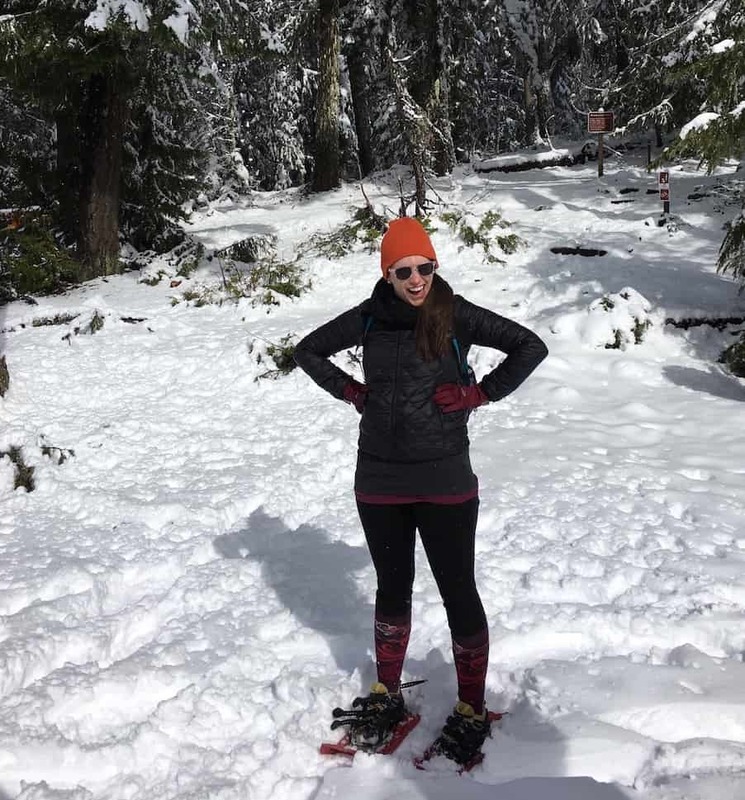 Surprisingly, I’ve never tried snowshoeing – and I’m from Siberia! This is a great guide, and I agree with you about planning a warm up activity. Love the pictures as well, I can almost imagine sitting by that fireplace with a glass of mulled wine! This National Park looks fantastic. I wish we had more snow in the UK, so annoying we don’t get snow and parks like this! A great post! This seriously looks like so much fun! I have never been on a winter hike before, but would really love to do it some time especially at a national park. Mt. Rainier looks so beautiful in the winter! I was there this summer and it quickly became one of my favorite US national parks. I’ve never actually hiked in snowshoes before, just crampons. It’s an experience I definitely need to try soon! I’ve been to Mount Rainier in the summer but never the winter. It looks like a lot of fun hiking in the snow on different trails. Thanks for the helpful tips on how to do it right and stay safe. Never hiked in the snow, but I’m very outdoorsy and live hiking in the heat! I would probably try this but with a guide, as you suggest. Sounds like a lot of planning and equipment is needed and I would rather just stay safe with a pro! I love winters and i love snow.This national park looks amazing. your photos are amazing too. I wish we had more snow here in India. I love winters!! And this place is looking so much interesting and amazing!! I’ll visit this place sometime. Your photographs looks so perfect. What a great city Seattle is. They had an unbelievable snow storm recently, did you see that? 2 to 3 feet in some areas from what I understand. Crazy! I’m glad spring is right around the corner.